Dürst Britt & Mayhew is proud to present a solo booth by British artist Alex Farrar (1986), which will function as a prologue for his second solo exhibition at the gallery opening on Friday 15 February 2019. In most of his works Alex Farrar refers in one way or another to the human body. He uses objects or materials that carry the imprint of a body (or part of the body), visualises physical behaviour (like sweating), deploys discomforting human habits (like biting fingernails) or creates sculptures that resemble body parts. At Art Rotterdam three distinct series of new works– night sweat paintings, semblable forest, and ‘umble prints– will coalesce in a scene that combines residues of the lived body with paranoiac visions and pataphysical logic. The monochrome night sweat paintings function as a procession of headless writhing bodies captured on downy bed linens. Following an earlier series of smaller and more abstract sweat paintings, Farrar has found in the more intimate subject of night sweat the body in repose, stressed not by any external presence but an imagined one. Various sorts of textiles that are taken for bed linens are painted with a silicone emulsion that the film industry uses to give actors a ‘wet look’. The depicted organic forms are based on the sleeping positions of various individuals and reveal which part of the body has contact with the bed. 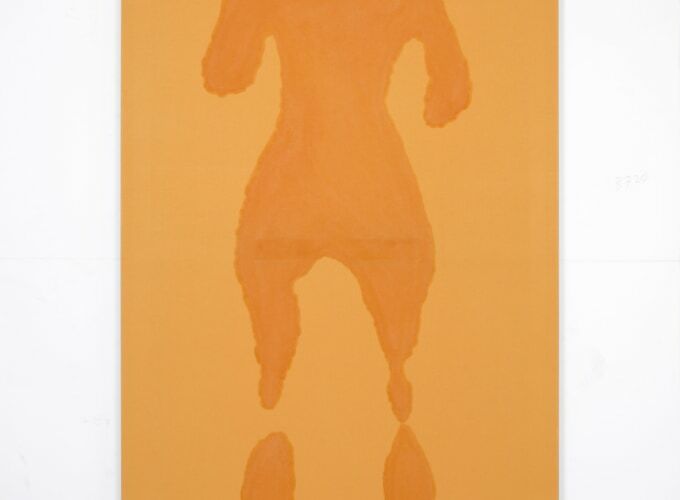 With a nod towards the Anthropometry paintings of Yves Klein, they share with Farrar’s previous sweat works a disconcerting materiality that is poised between the abject and the divine. Semblable forest is an assembly of several young trees felled upon reaching maturity. Made using a variation of the lost wax technique, with found tree stumps surrounded by plaster before they are incinerated, their voids replaced with bronze which is then broken out of the mold. Occupying the floorspace these modest monuments with trunks the span of your wrist and roots that reach out pointlessly, situate the booth in the midst of an unseen act of destruction. For his bright coloured riso-prints Farrar combines several forms of human heads with for instance a crabshell or an abstracted fingernail. These extracts of the body, be they animal or human, are assembled over pages of a book about bodily sensations.